The simple glide and rock, the beautiful construction and the built in comfort of the Amish Yellow Pine Marlboro Glider are sure to delight the whole family. Perfect for your porch, patio or pool area, this solid wood pine outdoor furniture invites you to take a break outside. 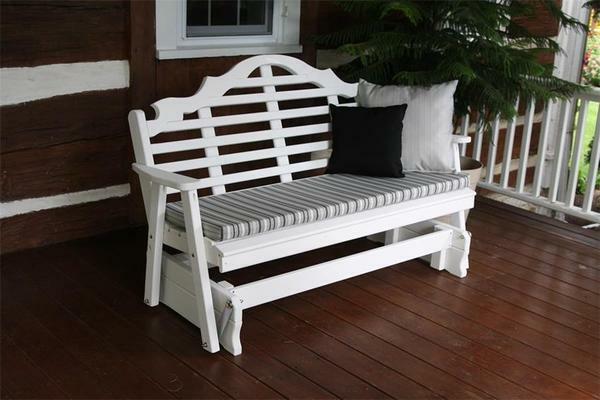 Made by the Amish in a wood shop in Pennsylvania means you can trust that this outdoor glider is a quality product that is built to last. Bring your reading material or laptop outside and enjoy the fresh air with the perfect place to sit. This comfy glider is made from untreated Southern yellow pine that is knot free. This is a durable wood that will perform well in your outdoor furniture collection. Treat yourself and your family to that special combination that is outdoor bench and swing in one! You create the look you like with our customization options making it possible. Three custom made lengths to pick from. Choose a 4', 5' or 6' pine glider. Wide arm rests ensure comfort as you glide. Choose stain or paint, we offer a variety of colors to pick from and will send some free touch up paint along with painted gliders. View our samples to help you decide. Add pine cup holders to the ends to enjoy beverages while you glide. Play with color and create the combination you love with our Sundown Fabrics. Choose the cushion and accent pillow combination you love.